As of today, Wipster now supports all asset types for creative feedback and collaboration: video, image, pdf, and, now, audio! Our new collaborative audio review solves the problem that many sound designers around the world face: how can collaborators leave time-coded feedback on audio in a streamlined, visual, and efficient way? 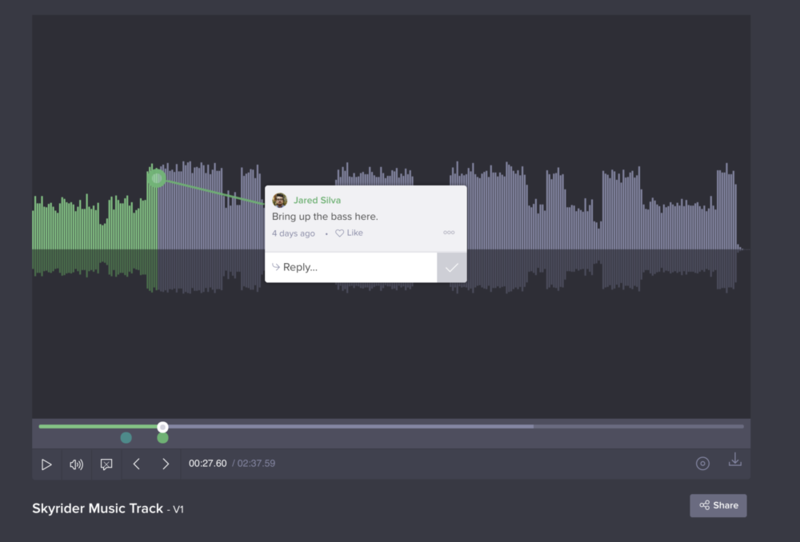 With Wipsterâ€™s new visual waveform feedback, Podcasters, Voiceover Artists, Sound Mixers, Composers, and Musicians alike can kiss those messy email chains goodbye and collaborate better than ever. Weâ€™re thrilled to be able to support and welcome amazing audio and sound editors alike to the Wipster family! So whatâ€™s exactly new in Wipster for our audiophiles? Read below. Audio feedback is designed in true Wipster style. Itâ€™s easy, simple, joyful, and intuitive! Just click on the audio waveform and start leaving feedback. Leave a pin-pointed comment on your audio files. When you upload your audio file and share it for review with your team or client, the recipient can also download the original file. So if you uploaded a .WAV, anyone with your link can download that original .WAV. For example, there are hundreds of remote voiceover recording artists around the world that will now not only be able to use Wipster to deliver their final voiceover audio file to their clients, but also allow them to leave detailed and pin-pointed notes. The same goes for recording artists, composers and more. A whole new world of audio collaboration just opened up! Our developers are hard at work to support all types of audio formats. Currently, Wipster supports .MP3, .WAV, and .M4A files. You can view all the types of files we support in Wipster here. If your audio files contain any of the above metadata, it will show in the â€œFile Dataâ€� tab on the right side of the frame. You can, of course, store and search for generic audio file information such as Filename, Length, File Size, Uploaded and Uploaded By. And while metadata is secondary to sound quality, it sure does make project management easier when you can easily search for content inside of your Wipster library. Find metadata under File Data on the right. Just like other media in Wipster, you can start your soundtrack process in pre-production and take it all the way to post! You can upload, collect, and store all kinds of sound effects, music tracks, and dialogue to use for your future audiovisual projects. For example, you can share multiple audio assets for review and approval beforehand to speed up your process. This helps your team or client, whether local or remote, listen and choose the best music track for your final video before you even get to editing! Itâ€™s also very common for musical composers to create multiple versions of the same audio track in various lengths. For example, there may be a full music track, an instrumental-only version, a 60 second version, a 30 second, and a 7-15 second sting. You can create a folder in your media library and drag each version into that one folder to stay organized. Upload, comment on, and store files in your Wipster Media Library. Better yet, if you have a new version of your audio file to send to a client, you can easily drag and drop your new version on top of the existing file. This doesnâ€™t replace it, but instead makes a new version. The versions are neatly stacked and easily accessible for cross-comparison. The same process applies to video, images, and PDF assets. Versioning in Wipster makes it easy for you to share 1 file, but see and track the evolution of the asset over time. Pretty nice, eh? Drag and drop a new version on top of an existing asset in your Wipster Media Library. So what are you waiting for? Upload your first audio file and amplify your audiovisual workflow. And if there is a feature youâ€™re dying to have for audio, leave a comment below and/or leave a feature request here.